0.039" (1mm) OD x 0.020" (0.50mm) ID x 0.039" (1mm) thick, Set of 10 pieces. 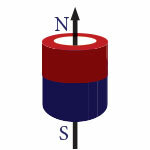 N50 Rare Earth Neodymium Ring Magnet, magnetized through thickness. Nickel Plated.